I’m sitting on the couch, blank faced and tired, staring at two small children wailing into their cereal. I don’t even know what started this off, aside from the Madness not wanting that particular bowl of cereal. I know she set off Jo because Jo was in a chipper mood and there’s nothing misery hates more than a chipper tablemate. Fortunately, it’s easy enough to take a threenager from zero to a hundred with a simple arm pinch. So now they’re trying to out-wail each other and I haven’t even had a single cup of coffee yet. I quit. I’m calling in sick. Who do I talk to about this? I don’t want to parent anymore today. It’s 7:45am and I’m done. The seven year old is not going to school, she tells me. She learned everything she needs to know in Kindergarten. That’s fine, I say, but you ain’t staying here with me. Feel free to come back around dinnertime so you can not eat some more of my food. And so weeping turns to rage. She begins hammering the coffee table with the pencil she got for being such a good helper at school. This is why we can’t have nice things, I think. I don’t bother trying to stop her, though, because the fact is we DON’T have a nice coffee table…not anymore. I’d have to take a belt sander to it just to scrape off the healthy layer of cheerio dust. “I want to eat somewhere else,” says the threenager, side-eyeing Madz’ decent into crazytown. She’s given up on crying, at least, and decided to play the “good child” card. She will get chocolate later. “I don’t blame you,” I say. She goes to the kitchen. Madz continues hammering the table and shockingly, she breaks the pencil. She’s undone. It was her favorite pencil. The wailing returns, only louder. “I thought you were TRYING to break it,” I say, legit confused. What did she think was going to happen? She climbs into my lap, her long limbs failing to curl up into me. It’s like trying to hold a greyhound – all legs and sharp elbows and already near as tall as me. “Fix it!” she weeps. “Tape it,” she pleads. 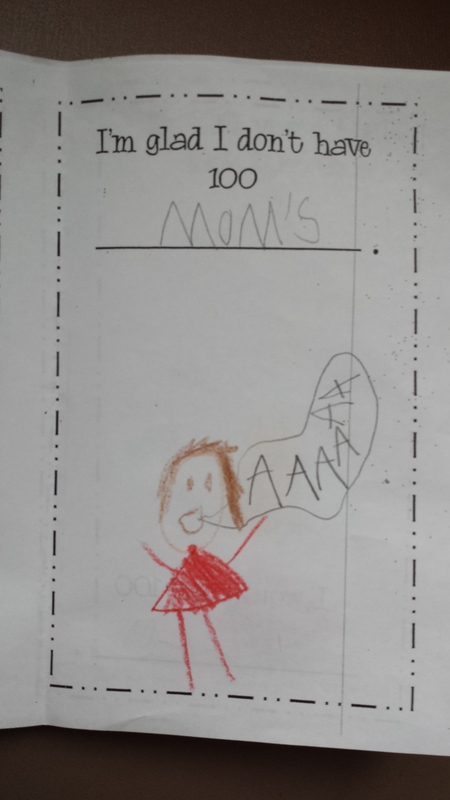 Here’s the thing – today is the 100th day of school. She’s supposed to dress up like a 100 year old. We picked out some outfits last night and I’m supposed to give her face wrinkles today. I live for this stuff. It’s Halloween in February – what’s not fun about that!? I have fake glasses, pearls, a plethora of scarves. Her Bubbie even gave her a cool old hat with a veil and a big velvet bow. We were super excited about this…14 hours ago. Okay, I was super excited. These are supposed to be the parenting moments that make it all worthwhile! How does she not know that!? And that’s how long it takes to get dressed. She hates everything. I put a scarf on her head, she rips it off. Then she tried to put it back on, but it’s all stretched out. I put it back on. Her ride shows up. I flip her off. After I close the door. Can you guess what I’m glad I don’t have 100 of!? I’m right there with ya. Every morning is a battle. I should start wearing armour…or at least ear plugs!